It's DERBY DAY! Well, actually, it's Friday at the time of posting. Tomorrow is derby day. So... it's ALMOST DERBY DAY! I feel like Arsenal always come into the North London derby in some kind of crisis. This time around I don't know how to feel. Arsenal have had some setbacks this month (in Dortmund and in the League Cup) but have had some positive league results to balance those out (a point from City and a comprehensive 3-0 win at Aston Villa last week.) So, if you've come here looking for some advice on how to feel, you're out of luck. Then again, I don't think that's why you're here. It's a critical week ahead for Arsenal Football Club: Spurs at home, Galatasaray at home, Chelsea away, then an international break. So, let's dive right in, shall we? No changes to the wounded list for Arsenal; we know that Nacho Monreal, Yaya Sanogo, Serge Gnabry, and most importantly Theo Walcott will not be returning until after the October international break. For Mathieu Debuchy, it'll be December and for Olivier Giroud, it'll be January. That means there can be no questions about who starts in the back four for Arsenal, considering the only first team bench options at the defensive positions are midfielders, like Matheiu Flamini (himself returning from a dead leg) and Francis Coquelin. There are, however, some questions in the midfield starting positions; Alexis Sanchez and Jack Wilshere dropped to the bench against Aston Villa, then played 90 minutes midweek in the League Cup. Arsenal have a home game with Galatasaray on the horizon (Wednesday) and a trip to Stamford Bridge next weekend (Sunday.) The good news is, Arsenal do have some rotation options in the midfield, though Arsene Wenger will not be happy with how some of his bench players performed against Southampton on Tuesday. Predicted XI: Szczesny, Chambers, Mertesacker, Koscielny, Gibbs, Arteta, Ramsey, Ozil, Cazorla, Alexis, Welbeck. Tottenham's only injured party is right back Kyle Walker, who underwent surgery on his lower abdomen in early September; there is no timetable for his return. Spurs have been delighted with the performance of Eric Dier, the 20-year-old who has deputized in the right back position. Mauricio Pochettino has named an identical XI in each of Spurs' two matches in the league since the last international break. Jan Vertonghen was dropped at center back for Vlad Chiriches, who partners with Younes Kaboul. Danny Rose has started all five league matches at left back, though he was subbed out for Ben Davies when the club trailed 3-0 to Liverpool in August. Mousa Dembele has come back into the starting lineup since the break to play in the holding role alongisde Etienne Capoue. Emmanuel Adebayor leads the attacking line, with Christian Eriksen, Erik Lamela, and Nacer Chadli behind him. Predicted XI: Lloris, Dier, Kaboul, Chiriches, Rose, Dembele, Capoue, Eriksen, Lamela, Chadli, Adebayor. 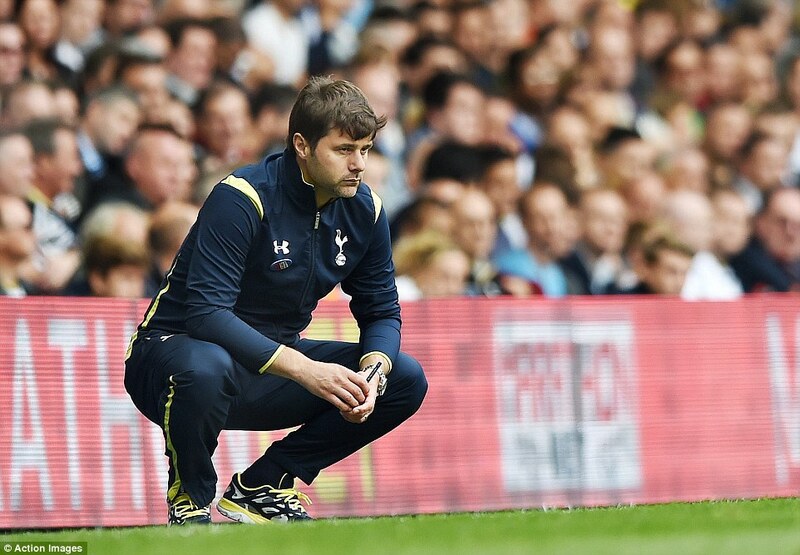 Mauricio Pochettino assumes the existential crisis stance. I've often tried to argue that form goes out the window for the League Cup; when there are so many changes to a side (Arsenal made 10!) you can't really compare that match to the others around it. That being said, the high note of Arsenal's 3-0 win over Aston Villa at the weekend lost a little bit of its luster after the club crashed out of the cup at the first hurdle. That said, Arsenal have not lost consecutive matches across all competitions since last December (at Napoli and Manchester City,) so they have that going for them. In their League Cup encounter, Spurs survived a bit of a scare from Nottingham Forest; the visitors led 1-0 at the Lane after a goal just after the hour mark, but Spurs netted three in the final 20 minutes to sneak through; Spurs will host Brighton and Hove Albion in the fourth round in late October. The win snapped a four match winless streak across all competitions for Spurs, dating back to the 3-0 reverse to Liverpool at the end of August. After the international break, Spurs drew Sunderland 2-2 at the Stadium of Light, drew Partizan in Belgrade 0-0 in the Europa league, then lost at home to previously winless West Bromwich Albion 1-0 last weekend. who cannot see ITV's on-screen graphic in the top left. Arsenal beat Spurs by a cumulative 4-0 scoreline over three meetings last season. Both meetings in the league ended 1-0 to the Arsenal. At the Emirates in early September, the day before the close of the transfer deadline that brought in Mesut Ozil, Arsenal captured all three points via an Olivier Giroud goal in the 23rd minute. Spurs had 56% of the possession, but both sides generated five shots on target in the match. At the Lane in March, Spurs had even more of the ball, to the tune of 59% possession, but could not fashion a goal out of it, thanks to a brilliant display from Arsenal's back line. Tomas Rosicky scored a thunderous opener inside the second minute, which held up through 90. The clubs also met at the Emirates in the third round of the FA Cup, a trophy Arsenal would, of course, go on to win. Arsenal won 2-0 with goals from Santi Cazorla and Tomas Rosicky. 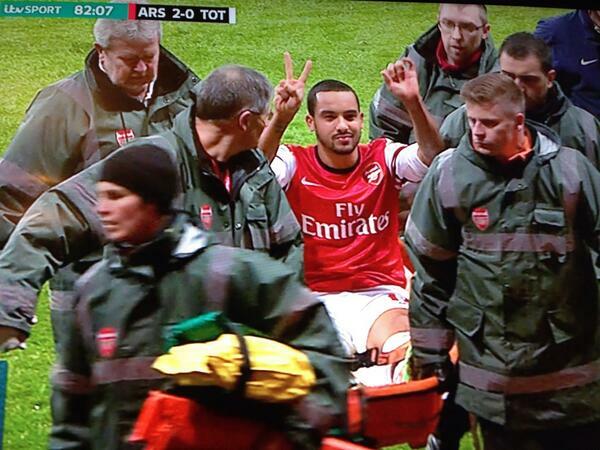 That's a scoreline you'll most likely remember thanks to Theo Walcott, who reminded the Spurs visiting support of the score while they berated him as he was stretchered off; of course, Theo hasn't played since. Last year's 1-0 win broke the streak of consecutive 5-2 victories for Arsenal over Spurs in the league encounter at the Emirates. Spurs' last win at the Emirates came in November of 2010, when Arsenal blew a 2-0 halftime lead to lose 3-2. At Highbury/the Emirates in the Premier League era, Arsenal have a record of 13 wins, 2 losses, and 7 draws against Tottenham. was harsh and later rescinded. The referee is Northumberland-based Michael Oliver. This is Oliver's second Arsenal match of the season, the first being the FA Community Shield, which the Gunners won 3-0 over Manchester City at Wembley in August. Oliver took charge of four Arsenal matches last season; interestingly, this corresponding fixture was one of them. The others were the penalty shootout win over Wigan in the FA Cup Semi-Final and road losses to Liverpool and Manchester United. Spurs had a mixed bag of results with Oliver in the middle last year: they beat Hull City 1-0 in October and Crystal Palace 2-0 in January, both at the Lane. On the other hand, they lost this fixture last September and also lost 4-0 to Chelsea at Stamford Bridge in March. Younes Kaboul was sent off by Oliver in that latter match; that red card was later rescinded on appeal.